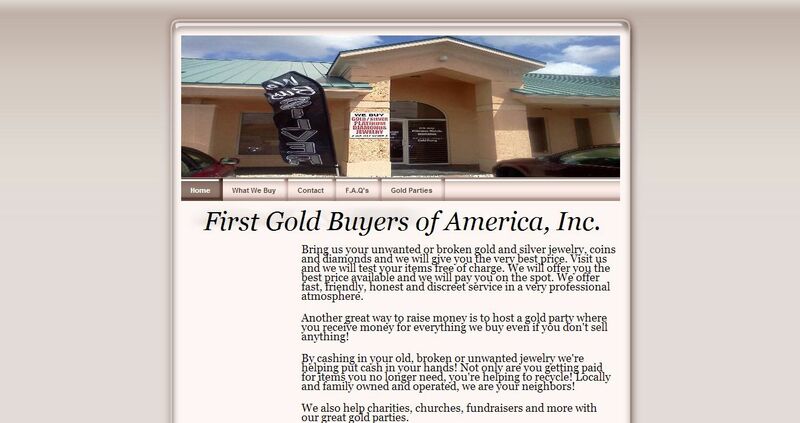 First Gold Buyers Of America address, phone, website, hours of operation, and more. Bring us your unwanted or broken gold and silver jewelry, coins and diamonds and we will give you the very best price. Visit us and we will test your items free of charge. We will offer you the best price available and we will pay you on the spot. We offer fast, friendly, honest and discreet service in a very professional atmosphere. Another great way to raise money is to host a gold party where you receive money for everything we buy even if you don’t sell anything! By cashing in your old, broken or unwanted jewelry we’re helping put cash in your hands! Not only are you getting paid for items you no longer need, you’re helping to recycle! Locally and family owned and operated, we are your neighbors!